The Captain has given me permission to “out” him. He LOVES The Sound of Music. He bought the DVD and every time it’s on TV, he watches it. I have seen the “16 going on 17” scene so many times it’s not even funny (that just seems to be the scene we happen on when he’s channel surfing, and then we settle in for the long haul). At first, I thought he was kidding when he said he liked that movie. But then I saw him watch it. More than once. AND buy the CD and load it into his iTunes. He thinks Julie Andrews’ voice is amazing (and heck yeah, it is!) and he likes the songs a lot. And the story is interesting since it’s based on a true story and set amid the turmoil of World War II and the rise of Hitler’s Nazi Germany. You have to understand, Captain Caffeine is rather a macho guy. He watches SportsCenter every night. He loves Ultimate Fighting (mixed martial arts). I think this makes him more endearing to me. Like finding out a Harley Davidson rider likes puppies. 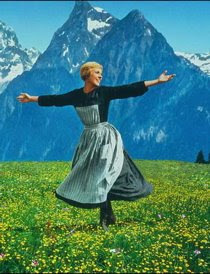 I love the Sound of Music!! It is one of my favorite musicals. Awesome. I LOVE Sound of Music. And He's right, she has an amazing voice! And I agree, I love the puppet show. Just love it, Capt Caffeine. You will be pleased to know my hubby could give you a run for your money on a love of coffee and Maria!